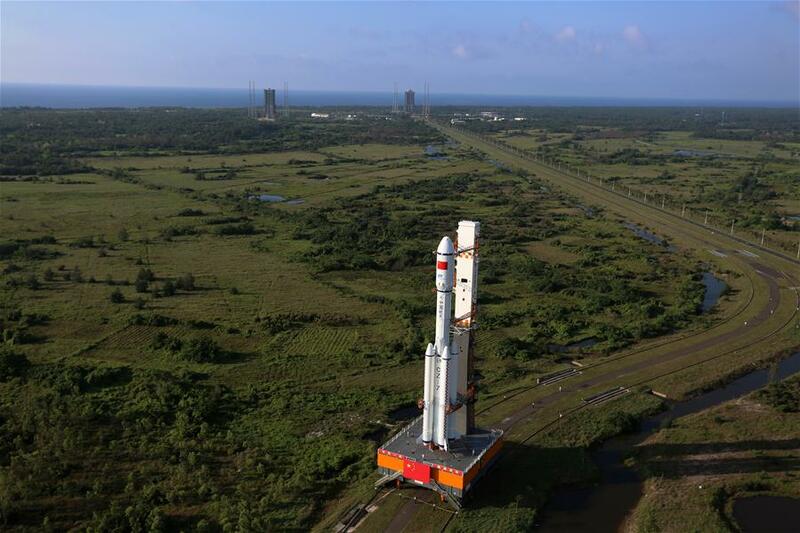 Chinese engineers rolled out a Long March 7 rocket to a seaside launch complex on Hainan Island in the South China Sea on Monday, aiming to fire a robotic refueling freighter into orbit as soon as Thursday to test technology for China’s future space station. The Tianzhou 1 spacecraft mounted on top of the 174-foot-tall (53-meter) Long March 7 launcher will dock with the Tiangong 2 space lab around two days after liftoff, the first of three linkups planned during the cargo carrier’s mission. 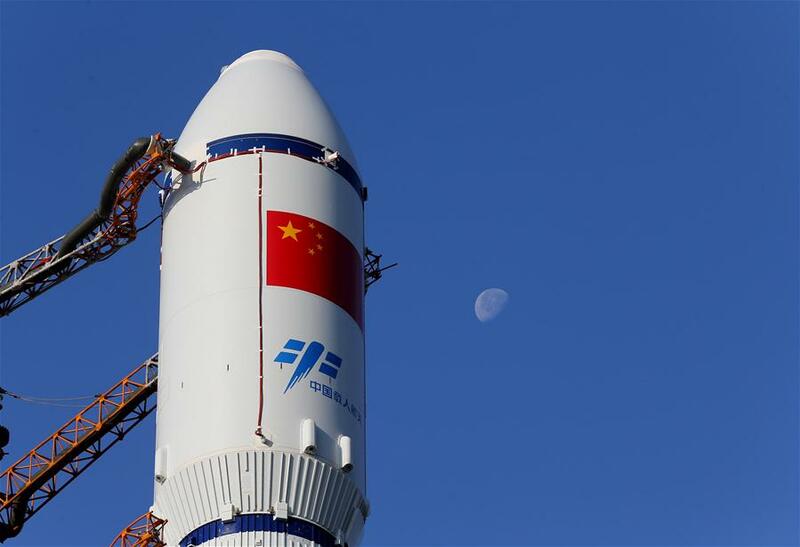 Chinese officials said the automated mission is due to launch some time between Thursday and next Monday. 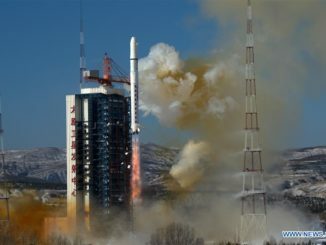 Carried on top of a mobile launch table, the Long March 7 emerged from its vertical assembly building around 7:30 a.m. Beijing time Monday (2330 GMT; 7:30 p.m. EDT Sunday) and made the 1.7-mile (2.7 kilometer) journey in about two-and-a-half hours, according to the China Aerospace Science and Technology Corp., or CASC, the state-owned lead contractor for the Chinese space program. The rocket and its 32-wheel mobile carrier weighed around 4 million pounds, or 1,800 metric tons, during the rail trip to the launch pad Monday. 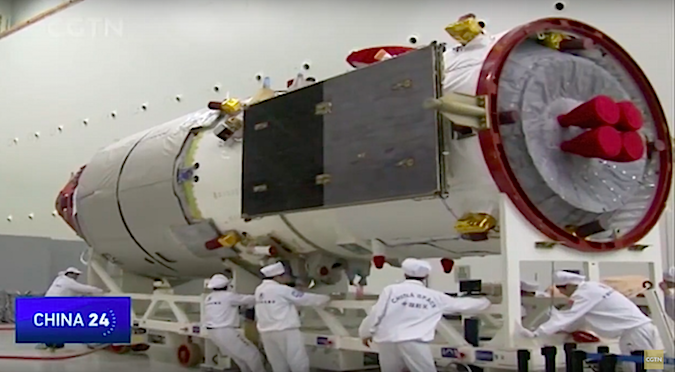 A time lapse video of the rollout released by Chinese state television is posted below. 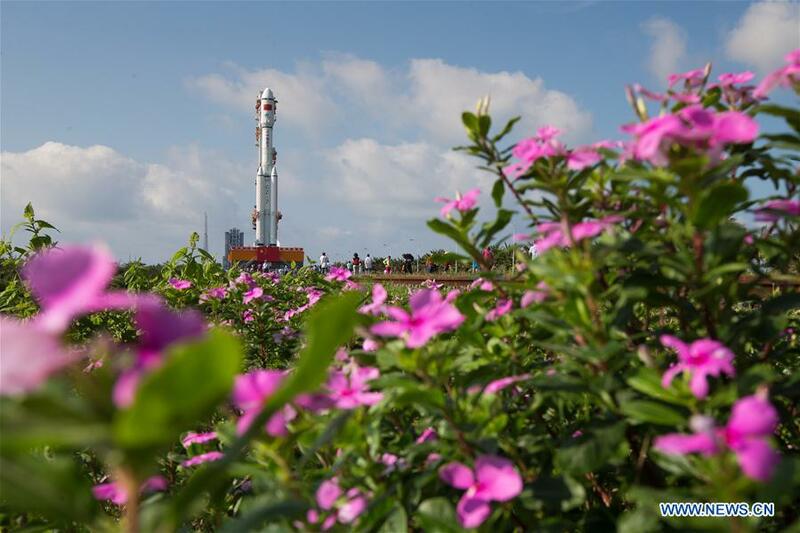 If the final preparations go smoothly, liftoff could occur around 1140 GMT (7:40 a.m. EDT; 7:40 p.m. Beijing time) Thursday from the Wenchang space center, a tropical facility on the northeast coast of Hainan Island that hosted its first space launch last year. The launch is timed for when the Tiangong 2 space lab’s orbit track passes over the Wenchang launch pad, allowing the Tianzhou 1 cargo craft to reach the human-tended module after deploying from the Long March 7’s upper stage. Tianzhou means “heavenly vessel” in Chinese, the name of a new series of supply ships designed to deliver supplies and rocket fuel to China’s space station, which is scheduled to be completed in orbit by 2022 to support three-person crews for six-month expeditions. Crews on China’s space station will need fresh equipment, experiments and other supplies during long-duration missions. The longest Chinese spaceflight to date was the Shenzhou 11 crew’s visit to the Tiangong 2 space lab last year, a mission that lasted approximately 32 days. Chinese officials said the Tianzhou 1 vessel, weighing nearly 29,000 pounds (around 13 metric tons), is the biggest and heaviest spacecraft ever built and launched by China. Mao Wanbiao, deputy commander at the Tianzhou 1 launch site, said Monday’s rollout marked the start of the final stage of launch preparations. “All work is going smoothly, and we are ready for fueling and launching,” Mao told China’s CCTV state-run television network. After the rocket reached the launch pad, a complex positioned around 2,000 feet (600 feet) from the beach, work platforms rotated around the Long March 7 to give workers access to the vehicle for final checks. The Tianzhou 1 spacecraft arrived at the Wenchang space center Feb. 13, and components of the Long March 7 rocket arrived in March for final assembly inside the vertical integration hangar. Designed to accommodate up to 14,300 pounds (6,500 kilograms) of payloads, the Tianzhou spacecraft is similar in purpose to cargo freighters that fly to the International Space Station, such as the Russian Progress supply ship and the commercial Cygnus and Dragon carriers built by Orbital ATK and SpaceX. In design and capability, the Tianzhou is most like Russia’s Progress and Europe’s now-retired Automated Transfer Vehicle, which carried dry goods, water and propellant to the orbiting outpost. The U.S. commercial supply ships and Japan’s HTV logistics vessel cannot refuel the space station. The Tianzhou 1 spacecraft measures around 34.8 feet (10.6 meters) long and 11 feet (3.4 meters) in diameter. Once in orbit, the spaceship will extend its power-generating solar panels to a span of approximately 49 feet (15 meters) tip-to-tip. He said the Tianzhou 1 mission is expected to last about two months, during which time the craft will dock with Tiangong 2 three times and refill the module’s liquid propellant tanks. 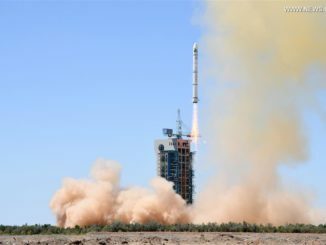 China’s state-run Xinhua news agency previously reported the Tianzhou 1 spacecraft will then fly on its own for around three months before re-entering Earth’s atmosphere. 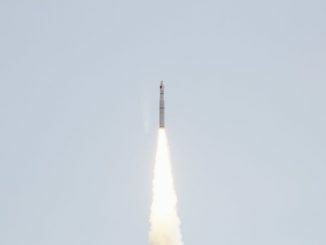 Thursday’s launch will be the second flight of a Long March 7 rocket, China’s new medium-class launcher that debuted on a test flight in June 2016. Powered by four liquid-fueled strap-on boosters and a twin-engine core stage, the Long March 7 will blast off with 1.6 million pounds of thrust. A single YF-100 engine is fixed to the base of each booster, each generating about 270,000 pounds of thrust, and two of the YF-100 powerplants propel the first stage, burning kerosene and liquid oxygen propellants. Four smaller YF-115 engines, burning the same kerosene/liquid oxygen mixture, are mounted on the Long March 7’s second stage. The Long March 7 is capable of putting a payload of nearly 30,000 pounds — about 13.5 metric tons — into low Earth orbit, and more than 12,000 pounds — 5.5 metric tons — into a sun-synchronous polar orbit up to 435 miles (700 kilometers) in altitude. China plans to launch the core piece of its planned 60-ton space station next year, followed by the addition of research and habitation modules. 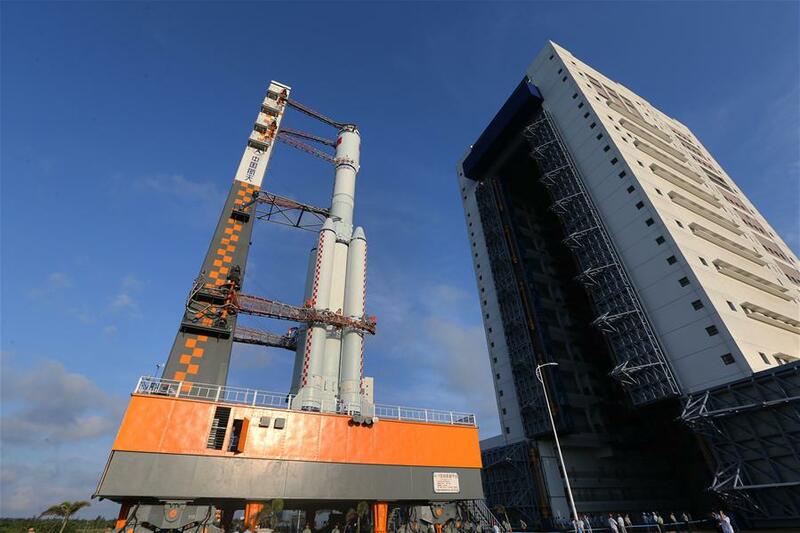 Crew and cargo ships could begin visiting the space complex soon after the launch of Tianhe 1, the central module, on a heavy-lift Long March 5 rocket from Wenchang. Built between 2009 and 2014, the Wenchang launch center sits at 19 degrees north latitude, closer to the equator than any other Chinese rocket base, giving China better access to place satellites in geostationary orbit. It also allows rockets to drop their spent boosters in the ocean instead of over land, as is the case with China’s landlocked launch sites. The Long March 5 is needed to loft the heavy pieces of the space station, and it accomplished a successful maiden flight in November. 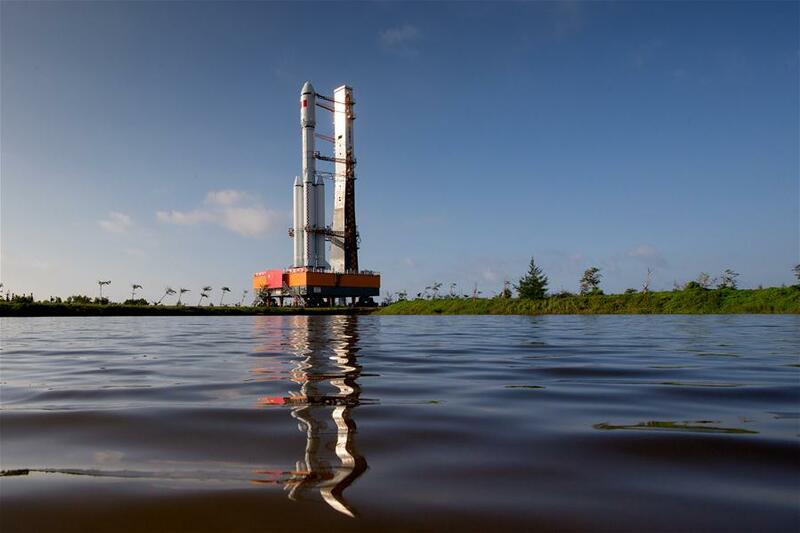 A second launch of a Long March 5 rocket is set for June, when it will take off from Wenchang with an experimental communications satellite. The third Long March 5 flight in November will dispatch China’s robotic lunar sample return craft, named Chang’e 5, to land on the moon and bring rock specimens back to Earth.